I love to do this with tomatoes that I’ve managed to buy still on the vine. There’s something about the bursting red flesh and the dark green stem that looks so inviting to me. 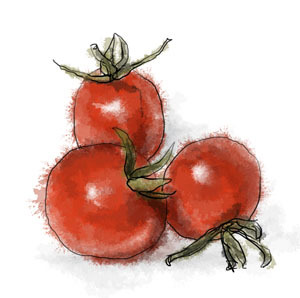 But more often than not, cherry tomatoes from a punnet are my fall back. The fruit stall on my block always seems to have them on special offer and they make a great side dish – it’s a rare person who doesn’t like them, as opposed to say, mushrooms, which at least a third of my friends won’t touch. Picky bunch. Sometimes I roast half a punnet for myself, to eat with a hunk of bread for lunch. They are delicious stirred into pasta, topping risotto or cous cous, or dressing up a dinner of bread and cheese. And they take ten minutes to make. You could replace the olive oil with basil oil or chili oil if the mood should take you, or top with grated parmesan cheese and chopped parsley half way through cooking to create a flavorful topping, but they are good just as they are.